A traditional look with contemporary flair. 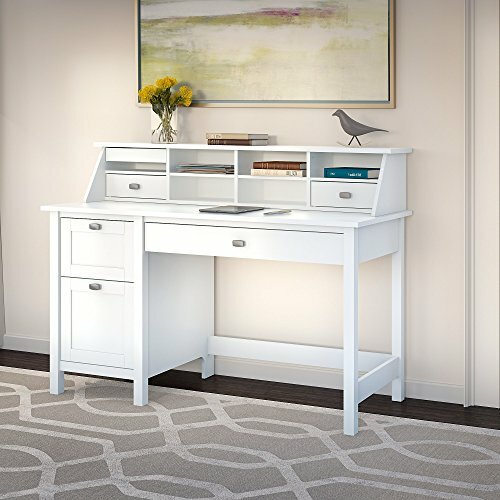 Bring style into the home office with the Bush Furniture Broadview Pure White Desk with Drawers and Organizer. Pull out a large drawer with flip-down front to set up your laptop or keyboard, and spread out with papers or a good book and a cup of coffee on the wide Pure White surface. Stash pens, paper and checkbooks in the box drawer while using the file drawer to clear the Computer Desk from clutter. Fill the drawer with letter-size files and enjoy full-extension ball bearing slides for a smooth open and close with easy access to the back. Find a place for everything with the Desktop Organizer. A pull-out accessory shelf can be placed in the top left or right cubby - a perfect spot for phones, a tablet or other electronic devices. Customizable drawers conveniently fit any opening and open slots provide easy access to work in progress. Broadview's sturdy post leg design provides years of trouble-free use, while the durable Pure White finish fends off scratches and stains for continued quality and a stylish appearance. Satin Chrome hardware completes the contemporary look for an appealing design in the home office. You'll enjoy this improved design with drawer slides and leg components that now come pre-assembled for significantly faster assembly. Backed by a Bush Furniture 1-Year Manufacturer's Warranty, Broadview meets ANSI/SOHO quality standards. See the full collection for coordinating items.